The 25 in. 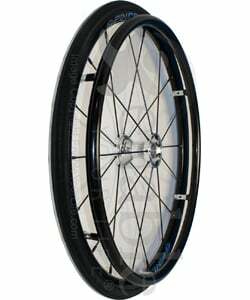 (559) Spinergy 18 Spoke Spox Wheelchair Wheel and Tire features a high quality lightweight design, straight pull spokes, double wall aluminum rim, and choice of tire. Choose the Primo Racer pneumatic tire, Shox flat-free urethane tire, the Aero-Flex™ flat free urethane tire, or the Kenda Kourier pneumatic tire. The Shox urethane tire is a solid flat free tire featuring a custom mix of elastomers allowing impacts to resonate throughout the tire, yielding superior shock absorption. The tread pattern is a full herringbone design. Black in color. Sized 25-559 (25 x 1 in.). You have a choice of hub width when ordering. The 1.8" hub width fits wheelchairs Invacare/Top End, and TiLite while the 2.3" hub width fits wheelchairs from Quickie, Colours, and Kuschall. Hub width is measured from bearing to bearing. This wheel comes with a 1/2 inch inner diameter sealed cartridge precision bearing designed for axle bolts or quick release axles..